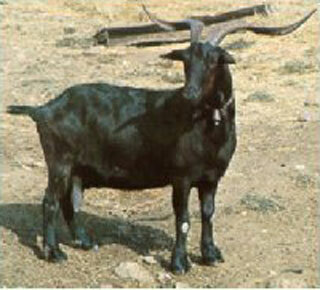 Verata Goats are a medium-small meat and dairy breed found in Vera, Caceres, Spain. They have twisted horns and they are chestnut, black, or grey colored. They are very hard and fairly easy to handle and they can adapt easily to different management systems. Verata Goats are best adapted to mountain pastures because they have strong, long legs, and they can also survive on poor and scarce feed. They are valued for their milk, mainly for cheese production. Currently, there is approximately 17000 existing Verata Goats inhabiting in Spain. Generally speaking, these goats are found in herds of 100 to 150 goats.